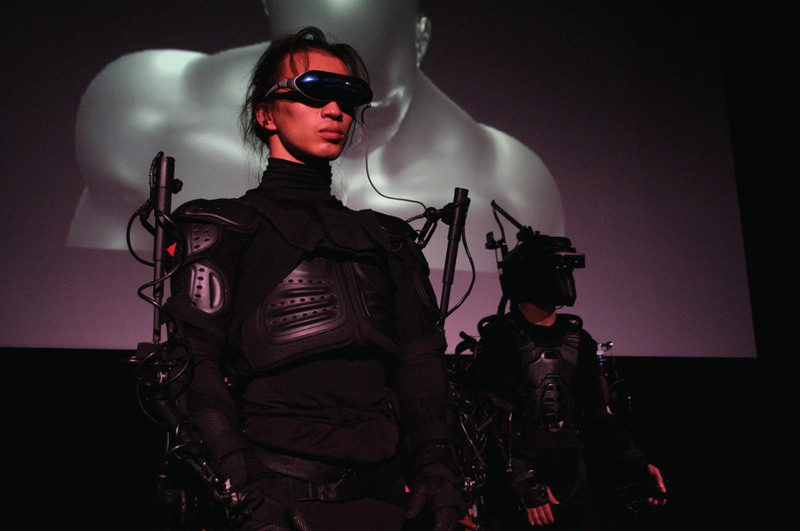 This performance links the real world to the online reality of Second Life at the physical level. The bodily movements of a person in the real world control an avatar in Second Life, while an avatar’s movements guide a human being’s movements. Second Life is 3D online digital world where flesh-and-blood humans create a unique identities (avatars) to inhabit the digital com-munity. Contact between these realities is usually affected through a monitor, keyboard, and mouse. In this work, the whole body takes part, through technology that makes communication between the two realities two-way and physical. A movement-registering mechanism built into a body suit allows a person’s movements to directly control the behavior of an avatar in Second Life. Conversely, a powered suit contains motors that control the human body like a marionette. It is a robot you can wear, controlled by an avatar. With this technology, geography, location, and space no longer hinder physical interaction between bodies. A Second Life avatar becomes a vehicle for physically connecting the individual to society. This could make it possible for people all over the world to share each other’s bodies over the internet. In this project, we do not know exactly who is controlling the powered suit or where they are in the world. Our bodies become a combination of “real” and computer-generated information. This performance is presented on the stage in the concert hall at Pacifico Yokohama. A worldwide audience can see or participate in the performance by downloading a customized version of the Second Life Viewer program (suguru.goto.free.fr/), logging in to Second Life (www.secondlife.com), and teleporting to the Second Life venue (suguru.goto.free.fr/).